© Copyright 2019 Jet Ski Safaris, All rights reserved. Here at Jet Ski Safaris, we run a jam-packed calendar of events for you to find the perfect tour during your Queensland trip. Take advantage of our great value lunch deals, like kicking off a terrific day of fun on the water with a Jet Ski tour around the Gold Coast’s North shores. 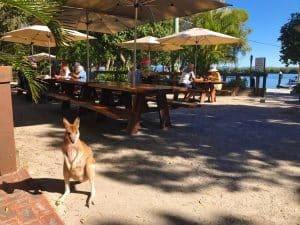 Winding past beautiful islands and stopping to relax at a tropical bar where you can visit the native wildlife, enjoy a swim and sip on a cool beverage. If you’re more of an early bird, we’ve got packages to get you up and racing on the water. With many specials throughout the year and flexibility to suit your itinerary, our jet ski hire is the perfect way to take advantage of your trip to the Gold Coast or Surfers Paradise. The original and the best! #voted no.1 of 209 things to do on the Gold Coast! Our Gold Coast Jet Ski Safaris take you right off the beaten track along the Gold Coast waterways, to untouched places where no other Gold Coast Jet Ski Hire company will venture. Subscribe to be notified of upcoming deals and exclusive safaris.